You just need tissue and a sponge. Setting your makeup is an important step in your routine. It will zap your skin of excess oil, and help you achieve a natural-looking finish. So if your foundation has been appearing a wee bit too cakey at the end of the day, you might want to try this trick! What you'll need: A piece of facial tissue and a clean wedge sponge. First, take your facial tissue and pull it apart, so you’re left with one ply. Wrap the tissue around your sponge. Do you now have a funny-looking powder puff? Yep, that's it. After you're done putting on makeup, take your new powder puff and start patting it on your face. 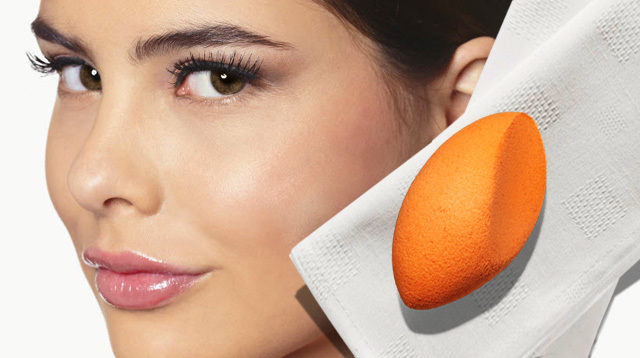 You’ll notice that the tissue absorbs the excess oils from your foundation and moisturizer. So in turn, you're left with fresh-looking makeup and a flawless face! Do you have any beauty hacks you want to share with us? Let us know by commenting below!